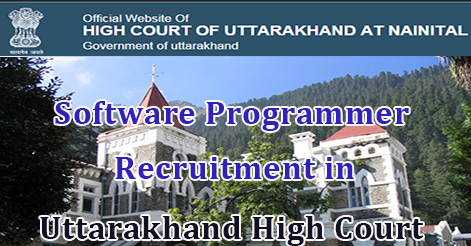 High Court of Uttarakhand, Nainital has released notification for filling up 05 vacant seats of Software Programmer. High Court invites applications for Software Programmer by direct recruitment. Candidate can apply for the given post on before 21 March 2016. This is purly contractual based job for 6 months. The Uttarakhand High Court is the High Court of the state of Uttarakhand in India. The Uttarakhand State was carved out from eastwhile State of Uttar Pradesh on 9 November 2000 under the Uttar Pradesh Reorgansisation Act, 2000. At the time of the creation of the State, the High Court of Uttarakhand was also established on the same day at Nainital. The selection process for the post will comprise of written test and interview. Candidate will be selected on the basis of their experience and performance in interview. The applicants are required to send their Curriculum Vitae along with one duly attested copy of High School mark sheet, High School Certificate in proof of age/date of birth, Intermediate Mark Sheet, Intermediate Certificate, Graduation/Post Graduation Mark Sheet and relevant experience certificate. Candidates are requested to mail their application form on highcourt-ua@nic.in on before 21 March 2016. Fee – The candidates belonging to General/O.B.C. Category must enclose a demand draft of any nationalized bank for Rs. 300/- and candidates belonging to Scheduled Class & Scheduled Tribe must enclose a demand draft of any nationalized bank for Rs. 150/- along with the application drawn in favour of Registrar General, High Court of Uttarakhand, payable at Nainital. Help us to improve this article/job posting "Software Programmer Recruitment in Uttarakhand High Court". We would be glad if you can comment below and provide your valuable suggestions and feedback. If this page have any wrong information/list or out of context content, then you can report us as well.